The weather forecast for today was dire (and it is March 31) with many area schools in Massachusetts even closing early. Luckily, the day was just gray with some cold drizzle, and our speaker, Dr. Ozlem Ergun from Northeastern University, made it from Boston to Amherst. We had invited her to speak as part of our great UMass Amherst INFORMS Speaker Series, which the Student Chapter helps me to organize. The chapter does a terrific job advertising the talks, handling much of the logistics, including a reception prior to the talk, and providing information on its website as well as a newsletter through an e-list. Special thanks to officers: Pritha Dutta, Deniz Besik, Ekin Koker, Destenie Nock, and Amro El-Adle, for their hard work before and after the event today! 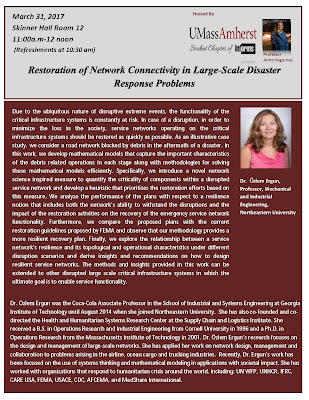 Dr. Ergun's presentation was on a topic of great interest to me - Restoration of Network Connectivity in Large-Scale Disaster Response Problems. The Chapter President, Pritha Dutta, had prepared the nice poster below announcing the talk, which also made the UMass Amherst homepage under events and was advertised at the Isenberg School on our fancy electronic displays. Professor Ergun has been involved in humanitarian logistics and disaster relief research for a long time and joined the faculty at Northeastern University after being on the faculty of Georgia Tech. She is especially known for her work on debris removal post disasters. Her talk today focused on the restoration of network connectivity, specifically, critical infrastructure, such as transportation networks, in order to enable service networks to become, again, operational. For example, think of the destruction of roads and bridges post a disaster such as an earthquake and one wishes to deliver relief supplies and personnel from points of supply to points of demand under such conditions. Which roads should be repaired in the sense of removing debris so that they become passable and network connectivity in order to accomplish desired emergency response tasks is restored? She noted that multiperiod models are needed since in a given time period one may have only a certain amount of resources available. She emphasized that if you can't get rid of debris you can't recover (just think of Haiti post the earthquake). Emergency agencies provide guidelines but not how to do it! She emphasized the importance of integrating operations research and network science, which I fully concur with. Her talk especially resonated since I teach and do research on humanitarian operations and disaster relief and have also co-authored the Fragile Networks book with my former Isenberg School doctoral student and now tenured Associate Professor, Dr. Patrick Qiang. 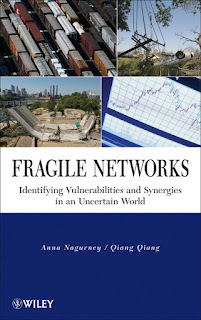 And, coincidentally, I was just teaching the Nagurney-Qiang network performance measure and importance indicator for both nodes and links in my Humanitarian Logistics and Healthcare class last week! 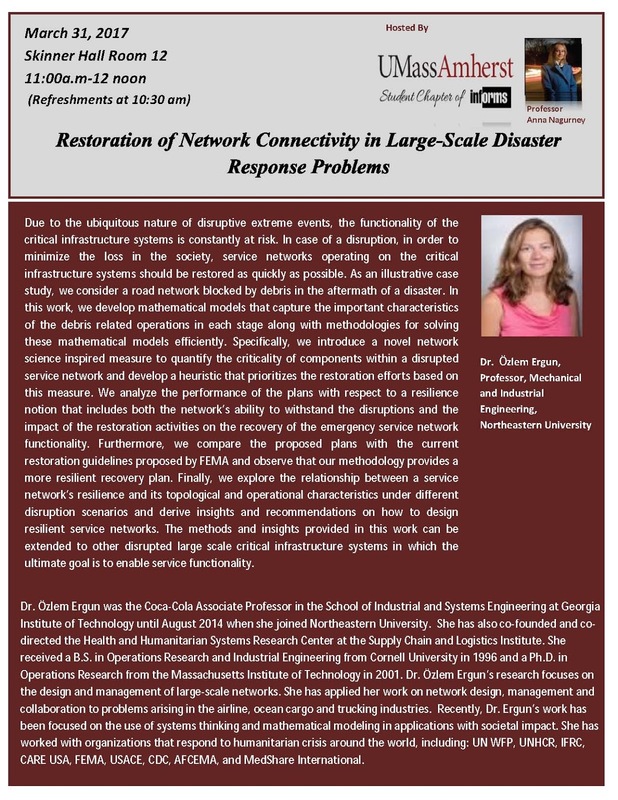 I very much like how Professor Ergun emphasized that it is not just the topology of a network (or graph) that matters, before and after destruction/deterioration, but also what services are provided on the network! Since operations researchers care about a variety of activities on networks from transportation and logistical flows to even financial and informational flows, this is quite "natural" for us. I also would put this in the area of "supernetworks." She shared with us a network betweenness measure which she had extended with her doctoral students and then took us on a fascinating journey of a case study of resiliency of Boston versus Manhattan (two of my favorite locations on the planet)! She also presented an optimization problem, which one would need to solve in seconds consisting of the maximization of the benefit of making the connections over the time periods, given supply and demand points, and a variety of constraints. Professor Ergun brought several of her PhD students and members of Northeastern's INFORMS Student Chapter to UMass Amherst, which made her visit extra special since our UMass Amherst INFORMS Student Chapter members could interact with their "sister" chapter in (eastern) Massachusetts. I hosted the lunch at the University Club and the service and food were fantastic. Although it is a Friday, I suspect that many others had cancelled because of the weather forecast, which did not come to fruition! We enjoyed the clam chowder and the salad with crab cakes and we shared the chocolate torte, lemon mascarpone cake, and the cheesecake, which we had with tea and coffee. Professor Ergun made it back safely with her students to Boston. Tomorrow is April Fool's Day and there is snow, again, in the forecast! Operations researchers are resilient and we are so grateful to Professor Ergun for coming to UMass Amherst to speak and for also bringing some of her students and chapter officers of the INFORMS Student Chapter at Northeastern University! Yesterday was a glorious day and the last day of the Northeast Decision Sciences Institute conference, which took place March 22-25, 2017, in Springfield, Massachusetts. The full conference program can be downloaded here. Given the proximity of Springfield to Amherst, Massachusetts and also the opportunity to network and to present papers, this was a conference that my doctoral students in Management Science and I were very much looking forward to. The conference was wonderful and below I share just a few of the highlights and also some pleasant surprises. My doctoral student in Management Science, Shivani Shukla, presented our paper on freight service provision security investments for high value cargo on Thursday. Yesterday, Deniz Besik, presented, for the first time at a conference, our paper, which was recently accepted for publication in the Journal of Global Optimization. Then it was time for Pritha Dutta to present on our work on game theory and blood donations. Our PhD students were terrific at answering questions from the audience and also enjoyed seeing other colleagues from the College of Engineering at UMass Amherst and even UMass Boston! Their full presentations can be downloaded here. Also, the other Professor Nagurney - Dr. Ladimer S. Nagurney, enjoyed seeing his colleague from the Barney School at the University of Hartford. Everyone appreciated very much the attention to detail with numerous delicious receptions throughout the day. Last evening, before the sumptious gala banquet, we had the pleasure of hearing my colleague, Nirenberg Chaired Professor Charles "Chuck" Manz, deliver a keynote talk on Twisted Leadership. His presentation was fascinating as he took us on a journey discussing self-leadership, super leadership, shared leadership, and socially responsible leadership and how all of these should be intertwined like a rope. We had front row seats for his talk. He was introduced by the conference organizer, Dr. Minoo Tehrani. His talk was interspersed with many interesting cases from practice as well as words of wisdom from leaders over the centuries and also jokes. The food was delicious and we thank the organizer and the venue - the Marriott in Springfield - for the soup, salad, roasted veggies, potatoes, beef, chicken, and salmon and incredible desserts! Towards the end of the banquet, the awards were announced and what a truly special surprise awaited us. The PhD presentation awards were swept by Isenberg School of Management PhD students in Management Science! A big congratulations to Pritha Dutta, who received the first place award for presenting on our work on blood donations, and to Yueran Zhuo, whose advisor is my colleague, Professor Senay Solak, and who spoke on management of cybersecurity investments, and received the second place award. Pritha was presented with the first place award by Dr. Joy Field of Boston College and Dr. Minoo Tehrani. Many thanks to all those involved for such special memories and congratulations to our wonderful Isenberg School PhD students in Management Science! Being able to present in an engaging and informative way on challenging, technical problems with enthusiasm and clarity is quite an accomplishment! Today we had the great honor of hosting Dr. Mahmoud Hariri, who is a Scholars at Risk Fellow at Harvard University, as a guest speaker in my Humanitarian Logistics and Healthcare class. His guest lecture on the Syrian Crisis had been scheduled for March 7, but, since he had gotten into a course at the Macy Institute at Harvard, he asked for a postponement, and I graciously agreed. It was worth waiting for him! There were logistics involved even in terms of getting him to speak to my class, which meets on Tuesdays and Thursdays at 8:30AM at the Isenberg School of Management. Since he is now at Harvard University for a few months, before returning to his home country of Syria, I arranged for a 6:15AM pickup in eastern Massachusetts and he arrived at the Isenberg School at 8:15AM! Last night he had been busy speaking on a panel at Harvard and meeting with Syrian doctors until midnight. Dr. Hariri has to be one of the bravest people I have ever met and, in teaching this course and working on disaster relief and operations research, I have communicated and interacted with many courageous and outstanding scholars and practitioners in this field. He began his presentation by providing us with an overview of the Syrian Crisis and illustrated his presentation with numerous personal experiences. As a trauma surgeon, he has had to work in (and is now even helping to construct) makeshift hospitals, has driven an ambulance (these are usually covered in mud to camouflage), and has seen healthcare facilities targeted with bombs, especially using a double bomb attack tactic. He shared with us conditions in prison that are so horrific I will spare you the details, but even children are imprisoned for "crimes" allegedly committed by a parent, which could even involve giving medical care to a patient. Elderly parents are not spared. 3. continue one's education, if feasible. Through incredible creativity and the novel use of technology he is working on educating medical students in Syria, most of whom will not be trained doing dissections, but will work directly on patients, many suffering from war wounds due to bombs and other weapons. One hospital that he has worked at was targeted 25 times. The health system in Syria has almost collapsed with more than 50% of those working in hospitals now volunteers. For security, they have moved hospitals underground and emergency rooms are sometimes located separately from hospitals to reduce the chance of detection and strikes. Dr. Hariri, has, at times, had to operate on patients, who are blindfolded, so that they don't recognize him in the community as a doctor, since medical professionals are targeted. His creativity, drive to do good and help, have resulted in such innovations as having 5 ICUs being monitored from the US, medical education via smart phone, and with students studying on smart phones. He emphasized the importance of learning English among students in Syria and that even a warehouse of books was destroyed by the regime. Many of the books had been provided by the Dutch. 2 and a half million children in Syria are not in formal schools and mothers are trying to home school children. Some of the bombs that are being dropped are in the form of toys. There are now 5,000 Syrian doctors in the US but fewer than 2,000 in Syria. To show you how dire the situation is, when speaking to militants, he was told that they did not want a hospital located in their area, since it was too dangerous! What a challenge for operations research and applications of location theory! Dr. Hariri believes that education is essential and will be pivotal in changing the crisis in Syria, a country in which dozens of weapons have been used in experiments. His presentation, on Prezi, can be viewed here. The love for his country, his brilliance, ingenuity, dedication, energy, and passion for doing what is right shone throughout his presentation today. Below is a photo taken after his lecture. I presented him with a plaque for being a Professor for a Day and also a gift from the Isenberg School. Afterwards, several students lingered to ask him more questions. Many thanks to a humanitarian hero - Dr. Mahmoud Hariri, for a lecture that noone in the audience will ever forget. For a nice article on Dr. Hariri in the Harvard Gazette, click here. Is there anything more delicious than a ripe peach or mango? Or, perhaps, you love biting into a sweet, crisp apple? I love my fresh fruit and veggies and, frankly, we are spoiled, in a sense, in the US, where we can savor berries and cherries even in the winter. You probably also enjoy a variety of vegetables and I am not speaking of just French fries. At the same time, when the "fresh" produce is not so fresh, one gets quite disappointed and the wastage associated with this industry is vast. Quality of fruits and vegetables is a topic, hence, of great research and practical interest and not only for food scientists and economists, but operations researchers as well. The first paper that my group published on fresh produce supply chains was: Competitive Food Supply Chain Networks with Application to Fresh Produce, Min Yu and Anna Nagurney, European Journal of Operational Research 224(2): (2013) pp 273-282, a paper that is highly cited and was even recognized by the Editors of the journal in a special session last July at the fabulous EURO conference in Poznan, Poland. You can read my blogpost, which even has photos of delicious pierogies here. In this paper, we utilized game theory to capture competition among food firms, who differentiate their products, which are perishable, and we applied the model to a case study of cantaloupes, subject also to a disruption. 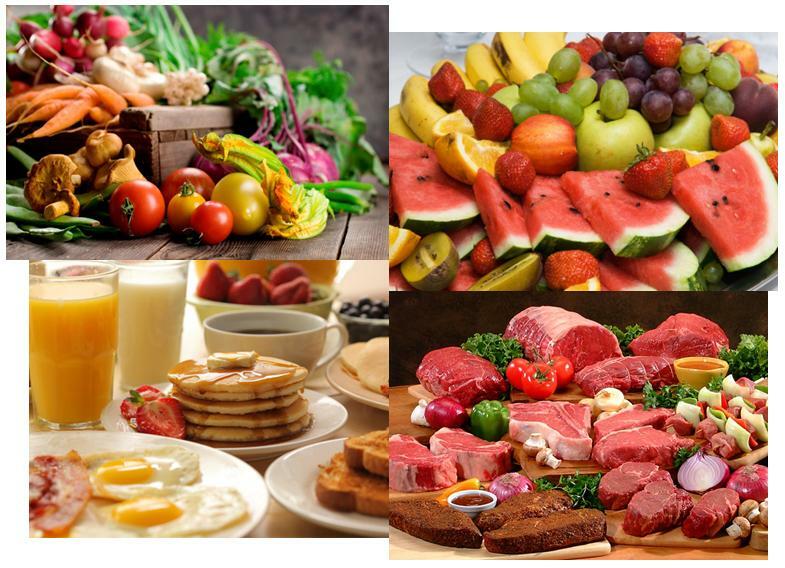 Indeed, there have been some major quality issues resulting in food-borne illnesses in this sector. Quality in this paper was modeled using a generalized network framework with link multipliers and it was assumed that as the fresh produce "moved" over links in the supply chain that a certain percentage would "perish" and would, hence, be discarded. Deniz Besik and Anna Nagurney, which is now in press in Socio-Economic Planning Sciences, we used kinetic formulae to model quality deterioration over time and under temperature conditions. I think that this is super cool and very much enjoy bringing scientific disciplines from chemistry to physics to operations research supply chain modeling. We then applied the model to apple farms in western Massachusetts, and, since one of the farms was Apex Orchards (one of my favorites), below I have photos of their relatively new store in Shelburne Falls. And I can't resist sharing the photo below of the bridge of flowers in neighboring Shelburne. In Amherst, we have a farmers' market from May through October in downtown, which is very enjoyable and also highly social. The Farmers' Market then moves indoors for the winter and whenever we are in town we always visit and purchase produce. You know where it is coming from and when it was picked. Our paper we dedicated to Robert Colnes, who owned an orchard in New Salem and who was a fellow Brown University alumnus. Deniz had interviewed him multiple times. He passed away a few months ago at age 96 and before we could share with him the good news that our paper had been accepted for publication. He was so generous in answering questions. Last spring/summer I spent several months as a Visiting Fellow at All Souls College at Oxford University (a simply heavenly intellectual and aesthetic experience that will be very hard to top). While at Oxford I would regularly go to the Farmers' Market in the center of Oxford and the photos below capture some of the spirit of it. The food stalls at the Oxford Farmers' Market are fabulous and there is a wide variety of ethnic cuisines for purchase. In the paper, Supply Chain Network Capacity Competition with Outsourcing: A Variational Equilibrium Framework, Anna Nagurney, Min Yu, and Deniz Besik, in press in the Journal of Global Optimization, we used game theory, but the governing equilibrium concept was a Generalized Nash Equilibrium (rather than a Nash Equilibrium as in the above papers), since the producers' constraints, and not just their utility functions, depended on the strategies of the other producers. The case study was to apples in western Massachusetts. We used variational equilibrium to formulate the problem. What I find so special about the discipline of Operations Research is that you can work on what you love and that includes food supply chains! There are so many advantages to going to professional conferences from the networking and exchange of ideas and research results to seeing new places and even practicing your public speaking skills. It is especially important for doctoral students to have opportunities to present at conferences. Our major professional conferences usually take place only once a year from the INFORMS conference to the POMS conference. However, if you keep your eyes open you might find that there are conference opportunities in your region. Sometimes you may even still be able to sleep in your bed. For example, 6 years ago we co-organized the First (and so far the only) Northeast Regional INFORMS conference at UMass Amherst. We had a blast. With a team that included Professor Hari Balasubramanian of the Mechanical and Industrial Engineering Department at UMass Amherst and Dr. Les Servi of MITRE, plus a lot of help from the wonderful UMass Amherst INFORMS Student Chapter, the conference was a big success. It took place in May with flowers blooming. Plenary addresses were delivered by Dr. Brenda Dietrich of IBM, Professor Alex "Sandy" Pentland of the MIT's Media Lab, and Professor David Simchi-Levi of MIT. Dietrich spoke on a Smarter Planet; Pentland on Building A Nervous System for Humanity: Making Health, Financial, Logistics, and Transportation Networks Work; and Simchi-Levi on Flexibility - From Theory to Practice. Tutorials were given on Transforming U.S. Army Supply Chains and Modern Design of Experiments - Recent Advances in Screening Methods. In addition, panels were organized on: The Academic Job Search Process, Research in Academia and Industry, and How to Run a Successful INFORMS Student Chapter. The Isenberg School of Management Dean Dr. Mark A. Fuller provided welcoming remarks. Mary Magrogan of INFORMS and Tracy Byrnes (now Cahall) of INFORMS came out to support us and were a great help. I posted some photos from this conference on this blog. When I saw that the Decision Sciences Institute (DSI) would be holding its Northeast Conference (NEDSI) this month in Springfield, Massachusetts, I thought that this would be a nice opportunity for doctoral students in Management Science at the Isenberg School to present their work. Some of my former doctoral students have presented at DSI but I have never been to this conference. Springfield is only about 30 minutes from Amherst, Massachusetts and is the site of the Basketball Hall of Fame, some wonderful museums, and the Dr Seuss National Memorial Sculpture Garden. The chair of the NEDSI conference is Dr. Minoo Tehrani of Roger Williams University, where one of our former doctoral students, Dr. Farbod Farhadi, is on the faculty of its business school. The university is located in beautiful Rhode Island on the ocean. The NEDSI conference brochure was posted online today with the program. 1. 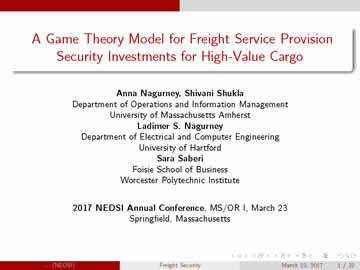 A Game Theory Model for Freight Service Provision Security Investments for High Value Cargo, which I co-authored with my doctoral student, Shivani Shukla, my former doctoral student, Dr. Sara Saberi, now a professor at the Foisie School of Business at WPI, and Professor Ladime S. Nagurney of the University of Hartford. Shivani will be presenting this paper. 2. 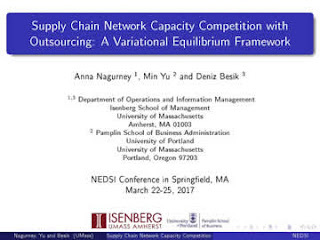 Supply Chain Network Capacity Competition with Outsourcing: A Variational Equilibrium Framework, co-authored with my doctoral student, Deniz Besik, and former doctoral student, Dr. Min Yu, now Professor at the Pamplin School of Business at the University of Portland. This paper is now in press in the Journal of Global Optimization. Deniz will present the paper. 3. 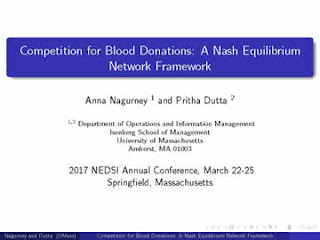 Competition for Blood Donations: A Nash Equilibrium Network Framework, co-authored with doctoral student Pritha Dutta, whose dissertation I am co-chairing. Pritha will present our paper. There will be a banquet on Saturday, as part of the conference, which will be a nice reward for the doctoral students' hard work! I arrived back from Washington DC about 1AM this morning after a late flight. I was in DC to speak and take part in a fascinating international expert panel on Financial Supernetworks. 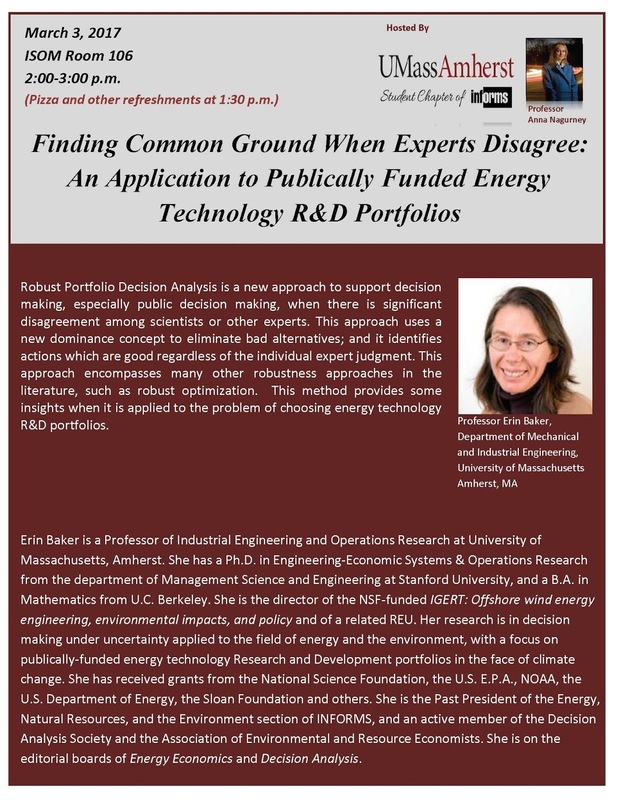 Today, I had a lot to catch up on but was very much looking forward to hearing my College of Engineering colleague, Professor Erin Baker, speak this afternoon in our UMass Amherst INFORMS Speaker Series. Her presentation title is below. This Speaker Series is organized by the award-winning UMass Amherst INFORMS Student Chapter. The students had brought food - pizza plus pastries and fresh fruit and rinks, which were served prior to Professor Baker's lecture. She was introduced by the very energetic and hard-working Chapter President, doctoral student in Management Science at the Isenberg School, Pritha Dutta. Professor Baker's outstanding talk presented a theoretical framework to handle "deep uncertainty," as when experts are in conflict or models are in conflict. She focused in her talk on the former. The very elegant theoretical framework consisting of alternatives, uncertainty, and preferences, along with expert beliefs used in a Bayesian way provide us what she and her collaborators are calling "belief dominance" in contrast to stochastic dominance and Pareto dominance. The framework eliminates bad solutions and from the set of the best ones identifies the robust ones. Her research focuses on decision analysis and energy, including renewables (and she is head of a big NSF IGERT project on wind energy). She is an active member of INFORMS. 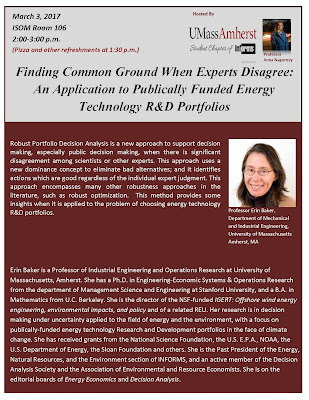 The application of the theoretical framework was to energy R&D portfolios since there is disagreement among experts on the best solutions for climate change. Part of the motivation for the research that she presented today was that dynamic decision-making under uncertainty and learning has been criticized as lacking external consistency. It does make a lot of sense that in robust decision-making (and multiple stakeholders) one should start with a small number of alternatives and share with the stakeholders. Stakeholders appreciate transparency. Her application to a portfolio of energy investment choices, such as nuclear, biomass, etc., at 3 different levels, was vividly illustrated in different colors highlighting belief dominance. There was an excellent Q&A that followed after Professor Baker's talk and I snapped the group photo below). Many thanks to Professor Baker for speaking today especially since you had even taught a class shortly before!